At first I said "Awww!" Then I thought, what an awesome lamp!!! "I'm just checking. That could have been a kitty treat hanging on the edge of her hat". Are other litters this naughty? This litter seems REALLY naughty. Ambrose! You are adorably naughty. Is naughtiness an A-E trait, I wonder? He is SUCH a stinker. I love it. NOM!!! Is this litter getting more air time or are these kitties the most mischievous ever? I think Charlene is sneaking catnip and rubbing it all over the place to get the little guys in trouble!! Hahahaha this makes me miss the kitten days - sorta. Don't miss the whole litterbox training crap. Though I'm having to hassle with Jadzia again for some reason. @Marlene....I'm thinking this is a litter that doesn't go looking for trouble, it just sort of finds them. The best litter ever...spunky very very spunky. Who's the little bowtied fella in the background photo? Oh, Ambrose and his investigating feet! 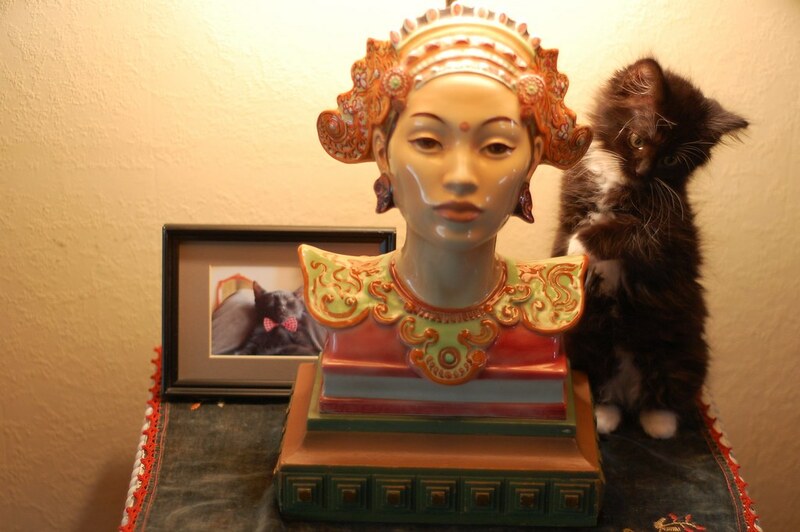 Awww, that's Cornelius in the background photo, Kitty! i don't think ceramic is very chomp-able -- but what do i know? My goodness, those A-E boys are sooo naughty. Seems like Ferris is the only A-E boy who has behaved himself -- unless I missed a post! And not a peep from the A-E girls. You know, when I looked at the first photograph in this series, I thought, "Gosh, that lady's hat looks DELICIOUS!" or are you saying it because you saw it?" Kitties!! They really love to explore!! I can see nothing but Cornelius. I have tunnel vision when it comes to that sweet, sweet bow-tie wearing fella. These little guys are adorable and cute, and full of rascally mischief. They're going to make their fur-ever homes very happy! ooh, the darling boy! Envying future Mom this adorable shot! Dude. Coolest lamp ever. Seriously. Also, to quote my grandmother, "He's a Dickens!" P.S. The socks-n-mittens just slay me. Sweetie...you are just too much! Gracious me! This is such a naughty bunch! Perhaps that is why I am so very fond of them! I'm with Meg above. Best. Lamp. EVAH!!! I absolutely LOVE your blog! Thanks for sharing! I think they just seem naughtier because there six of them. The girls are just as naughty as the boys, I just haven't caught them with the camera yet. 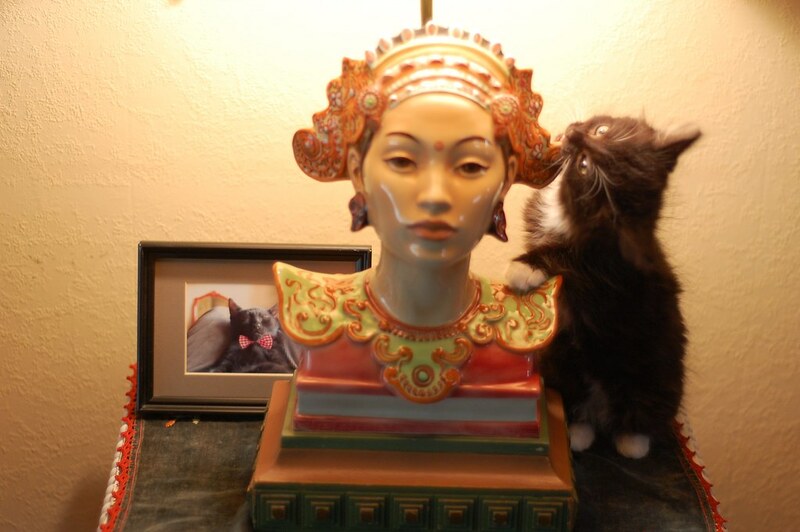 All your lamps seem to be kitty magnets. We ♥ Cornelius and need to frame that picture for our house, too! so did the lamp taste? Did you get a shot of Ambrose shake his head and sticking out his tongue afterwards. Silly kitties! Aw, G beat me to it. All I could think of is, "I love lamp." "Are you just looking at things in the office and saying that you love them?"